First, let's start with a brief explanation of how gemstones derive their color. When white light strikes a gemstone (or any colored object), the photons of certain wavelengths (i.e., colors) are absorbed and others are reflected or transmitted. So for example, a black object absorbs all the different wavelengths of visible light, and thus appears black; while a white object reflects all wavelengths. A blue gem absorbs all visible wavelengths except for blue. And so on for the different colors. This is a simplified statement of the absorption spectra for each gemstone type. In fact the absorption pattern for each gem variety is more complex and distinctive, with absorption bands at multiple points of the spectrum. The Chelsea Filter was designed to match the absorption spectra of emerald. It was developed in 1934 by Anderson & Payne of the gem testing laboratory of the London Chamber of Commerce & Industry, with the goal of helping gemologists discriminate betweeen natural emerald and gems such as green sapphire, tourmaline and peridot, and simulants such as green glass. The filter was developed with the collaboration of gemology students at the Chelsea College of Science and Technology, hence the name. A Chelsea Filter is a dichromatic optical filter, meaning that it allows transmission of only 2 colors of light: deep-red wavelengths around 690 nanometers and yellow-green wavelengths around 570 nanometers. These match emerald's emission and absorption properties. Chromium-rich emeralds emit a red fluorescence when illuminated by white light that also has a content of ultraviolet wavelengths. To use the filter, place the gem to be examined under strong illumination. Incandescent light will give the best results, because it is rich in red wavelengths. Flurorescent lighting, which is more blue, should be avoided. Place the filter close to your eye and observe the gem. It will appear some shade of red or green under the filter, or else a brownish hue (mixture of deep red and yellow-green) or black. Emeralds containing chromium will display red under the Chelsea filter, while other green gems such as green sapphire, green tourmaline and peridot will appear green. Other gems containing chromium, such as ruby and Imperial jade, may also appear red under the filter. Since Imperial jade can be a valuable gem, with many simulants, Chelsea filters are sometimes sold under the name Jadeite filter. Note that non-chromium jadeite will typically appear green under the Chelsea filter. 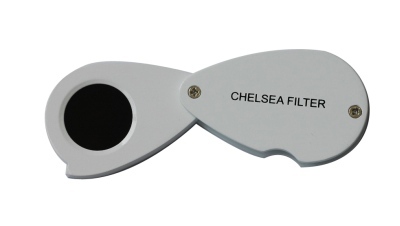 It so happens that a Chelsea filter may also detect cobalt, which transmits at a wavelength close to that of chromium. So a Chelsea filter may help to identify sapphires that have been glass-filled with cobalt-doped glass. It may also help to identify rare cobalt-bearing materials such as cobaltocalcite. However, note that a Chelsea filter is not able to detect synthetic emeralds which typically contain chromium. These synthetic emeralds will also display red or pink under the Chelsea filter. In addition, some non-Colombian emeralds, such as those from Zambia, typically contain vanadium as well as chromium, and usually appear green under the Chelsea filter. From this discussion you can see that that the Chelsea filter is not an uncomplicated or foolproof tool for gem identification. In modern gem labs it has been mostly superseded by more sophisticated diagnostic instruments such as spectrometers. Gem dealers still occasionally use a Chelsea filter when examining a parcel of similar gems, since it can sometimes help identify anomalies, such as synthetic stones mixed in a lot of natural gems.